This week marks the 10th anniversary of the first demo flight on biofuel which was done by Virgin Atlantic. LanzaTech CEO Jennifer Holmgren shared the factoid that, since that day, more than 100,000 commercial flights have used low carbon fuels. “This is especially amazing since in 2006 I was told over and over that biofuel flight would never be possible commercially; we aren’t gonna fly on anything other than kerosene,” she reminisced. 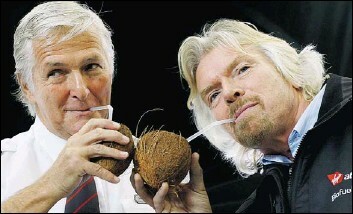 Sir Richard Branson sipping on jet fuel at the time of the 2008 Virgin Atlantic demonstration flight. That initial flight was actually a biodiesel blend cut to jet specs, and it was so clean that you could drink the oil, which Virgin CEO Sir Richard Branson did, out of a coconut shell with parasol and fruit. The gallonage is still minimal and airlines would like to use a lot, lot more. The hold-up continues to be cost, and to some extent production capacity, and here or there a carbon policy not well-designed for aviation is causing problem. But really, it’s the cost. Let’s do some math. Allowing for around 40 cents per gallon to amortize the capital expense of building a plant, and 20 percent margin to pay down the debt and offer venture-level returns for the partners taking elevated risks, it stand to reason that in a world of $2.00 jet fuel (more on that here ), a quick set of inputs on a canculator will tell you that you have $1.20 per gallon to pay for the operation of the plant, including feedstock. Allowing at least $0.05 per gallon for labor and other essentials, and think $1.15 for the feedstock, best case scenario, and that leads one quickly to a maximum price of 17 cents per pound. That rules out veggie oils and even choice white greases and fats, and yellow grease, too. Brings us down to really odious feedstocks that have almost no value at all, or even negative value. So, we have trash, and possibly brown grease or trap greases. Now, carbon prices can help a lot, if you believe they will be there for 15 years while the plant is being amortized. RINs can add a dollar in value and LCFS credits another 60 cents — or, nearly 24 cents a gallon, brining every waste grease into play and even the lower-value virgin oils. The biomass-based diesel credit of $1.01 per gallon adds another 16 cents. So it comes down to this: zero-cost feedstock (meaning zero cost now, and zero cost in 2030 too while the capex of plant #1 is still being paid off). Or, carvon credits. That’s why we reported last July that the two biggest challenges facing broader adoption of sustainable aviation fuel at Sea-Tac are the higher cost compared with petroleum jet fuel, and the constraints imposed by state and federal regulations on use of airport funds. A report, titled Innovative Funding for Sustainable Aviation Fuel at U.S. Airports: Explored at Seattle-Tacoma International, reveals the financial tools available to U.S. airports, and outlines legal constraints and financial impacts of each tool. The report found that no single tool could generate enough funding to cover the higher cost of biofuel, and recommended combining a number of funding tools. 1. While a U.S. airport cannot pay for aircraft fuel, it could pay directly for SAF co-benefits. Public dollars cannot cover a commodity used by a for-profit private firm. However, SAF produces direct air quality benefits, reduces greenhouse gas emissions, and supports regional economic development—all of which are valued by airports. These characteristics are referred to as SAF “co-benefits” for this report. 3. Infrastructure investment could jump-start regional SAF production. The most promising approach to support infrastructure is indirect via the procurement of SAF co-benefits. The certainty of a medium-to-long-term commitment made by the Port reduces investment risks for private sector funders. A longer-term contract from Sea-Tac to procure SAF co-benefits is favorable over one from airlines which are subject to greater market risks and exposure. Most other mechanisms identified for financing infrastructure projects are outside the Port’s legal scope. Focusing on funding SAF’s co-benefits is a better fit with the Port’s activities and mission. And, there’s a tussle over violumes. That’s why we reported that 25 countries convened by the UN International Civil Aviation Organization (ICAO) rejected the 2050 Vision on Sustainable Aviation Fuels that included volume-based targets for biofuels proposed by the ICAO Secretariat on October 13. The ICAO Secretariat’s proposal intended to see 128 million tons of biofuels a year being burned in plane engines by 2040, going up to 285 million tons (half of all aviation fuel) by 2050. By comparison, some 82 million tons of biofuels are currently used every year in transport worldwide. The proposal would have led to an unprecedented expansion in biofuel production, more than likely in poorer countries. It would have accelerated the expansion of industrial palm oil which Friends of the Earth says is major driver of land grabbing across the tropics, threatening the lives and livelihoods of millions in the developing world. There’s good news. As we reported in October, Qantas Airlines will buy 8 million gallons of aviation biofuel annually from SG Preston beginning in 2020 to use in all of its flights from Los Angeles to Australia, flying on a 50/50 basis. The decision was made because the aviation biofuel industry is more advanced in the US than in Australia but the company is working with partners to support the development of a domestic industry as well. The airline ran aviation biofuel trial flights between Sydney and Adelaide in 2012. In June 2011, the Secretaries of Agriculture, Energy, and Navy signed MOU to commit $510M (up to $170M from each agency) to produce hydrocarbon jet and diesel biofuels in the near-term. This initiative sought to achieve multiple, commercial scale integrated biorefineries, cost-competitive biofuel with conventional petroleum (w/o subsidies), domestically produced fuels from non-food feedstocks, and drop-in, fully compatible, MILSPEC fuels (F-76, JP-5, JP-8). 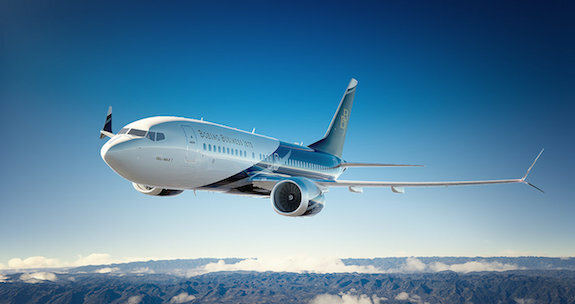 With the US Navy and Air Force as initial customers, the Secretaries aimed to transform the marketplace for renewable jet and marine fuels. How’s that effort proceeding? This illuminating presentation from the DOE’s Zia Haq and Borka Kostova was given at the 2017 DOE Project Peer Review. It works, biobased jet fuel, that is. And everyone knows that airlines have to address carbon. The problem comes down to feedstock — and making it sustainable, affordable, reliable and available. That’s SARA, and as SARA goes, so will aviation grow. Sara, Sara / So easy to look at, so hard to define.